Johanna Anderson sits chained Thursday morning to a pipe at the Vermont Gas pipeline construction site in Essex. Updated 6/19/2015, with information from T.J. Donovan and a comment from Johanna Anderson. 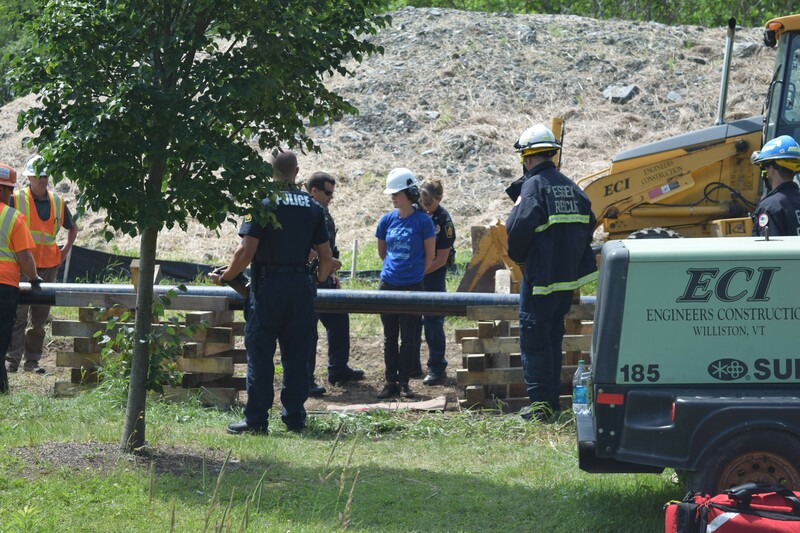 Johanna Anderson spent more than four hours Thursday morning chained to a pipe at the Essex construction site where Vermont Gas is working on a natural gas pipeline that is planned to run from Colchester to Middlebury. 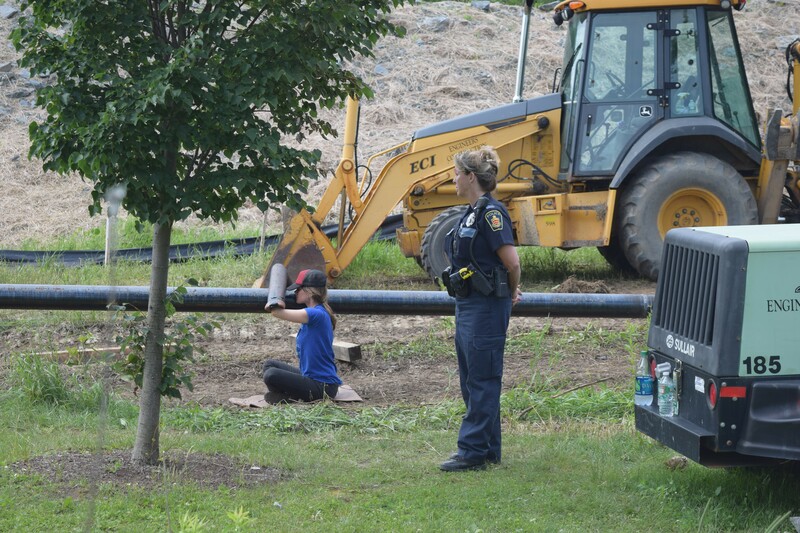 Anderson, 28, of Plainfield, gave up her protest as Vermont Gas crews started to cut into the pipe about 11 a.m. She unhooked her hands from it, stood up and traded the pipe for police handcuffs. Will her arrest boost opponents' case for stopping the pipeline? That's what they hope. The protest included about a dozen other activists of the climate-change group Rising Tide Vermont who gathered in support of Anderson. It came four days before the state Public Service Board convenes hearings on the project. Opponents are asking the board to reconsider permission granted for the project because its cost rose 80 percent. The company is arguing that the project is still in the public good. "We want our message to be heard," said Rising Tide spokesman Ryan Gillard, also of Plainfield. "Our main message today is: Scrap the pipeline." Rising Tide and other opponents of the project also plan an overnight vigil in Montpelier after the first of two days of hearings on Monday, he said. e long-term use of fossil fuels, which the group opposes. Vermont Gas spokeswoman Beth Parent argued that replacing oil or propane heat with natural gas saves households on average $2,000 a year. Parent said the company was unaware of the planned protest, which delayed a morning of work on the project. Project workers called the office to alert them shortly before 7 a.m.
Anderson was chained to part of a drilling rig being used to take the pipeline under Vermont 2A and Vermont 289. Essex police and Vermont Gas officials worked together to decide how to handle her situation, and opted to cut the pipe. They removed Anderson's ball cap and replaced it with a construction helmet. As they started, Anderson voluntarily released the chain holding her in place. She was being charged with disorderly conduct, resisting arrest and unlawful trespass — all misdemeanors — and unlawful mischief, a felony, Essex Police Lt. Ken Beaulieu said. But when she went to court, Chittenden County State's Attorney T.J. Donovan filed only one misdemeanor charge, unlawful trespass. Anderson, who said she is an outdoor educator who moved to Vermont a little more than a year ago, described the arrest as worthwhile. "We realize we have to take extreme measures," she said. Corrected, 6/19/2015, with the right route numbers that the pipeline is meant go under.